During his advertising career W.A. Dwiggins did a large amount of work for paper manufacturers and distributors, especially Strathmore Paper Company and S.D. Warren. His work for the latter occurred in two phases: 1911–1916 and 1917–1937. In the early years the work was done indirectly via Brad Stephens and his various businesses. The later work was done directly, principally through Watson Gordon who worked for the paper company in several capacities during those years. Dwiggins’ work with Gordon is fairly known. Less so is the work with Stephens. In 1914 Dwiggins illustrated and lettered three advertisements for the Heintzemann Press that were destined for use by S.D. Warren to promote its coated papers. They were headed either “New Ideas in Illustration” or “The New Ideas in Illustration”. The first advertisement promoted Lustro Coated, the second Cameo, and the third Silkote Dull-Enamel. They appeared in 1914 and 1915 in The New England Printer, the original Print, Direct Advertising and The Printing Art Suggestion Book both as single pages and as the first page of multipage advertising sections. Although I have seen no copies, contemporary trade literature indicates that at least one of the advertisements also existed as the cover of a series of advertising booklets issued by Warren in 1916. 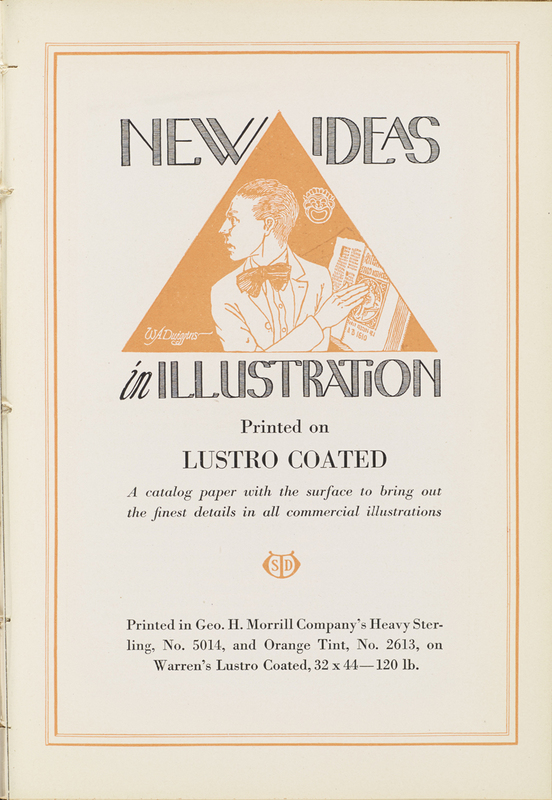 “The New Ideas in Illustration” advertisement by S.D. Warren & Co. (Print, vol. V, no. 4, 1915). Illustration and lettering by W.A. Dwiggins (1914). 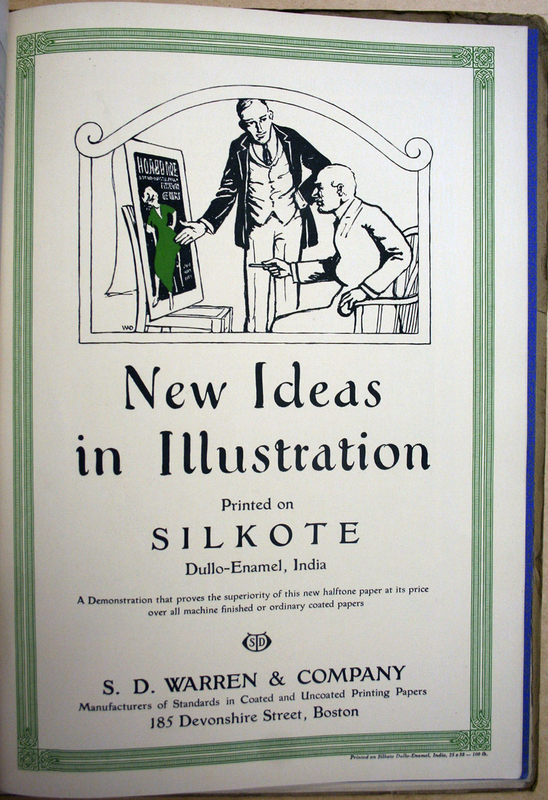 “New Ideas in Illustration” advertisement for S.D. Warren & Co. (Direct Advertising, vol. III, no. 3, Winter 1916). Illustration and lettering by W.A. Dwiggins (1914). Of the three advertisements, the most amusing and the most fascinating is the second with its depiction of an enervated artist, slouched in an armchair, using an airbrush to create a painting. He is aided by an African servant clad only in a loincloth who operates the compressor and a monkey who holds up the stencil for the artist. Although superficially funny, the meaning of the illustration is quite complex. The compressor is actually a conflation of a real compressor for an airbrush with the pump portion of an electric vacuum cleaner. 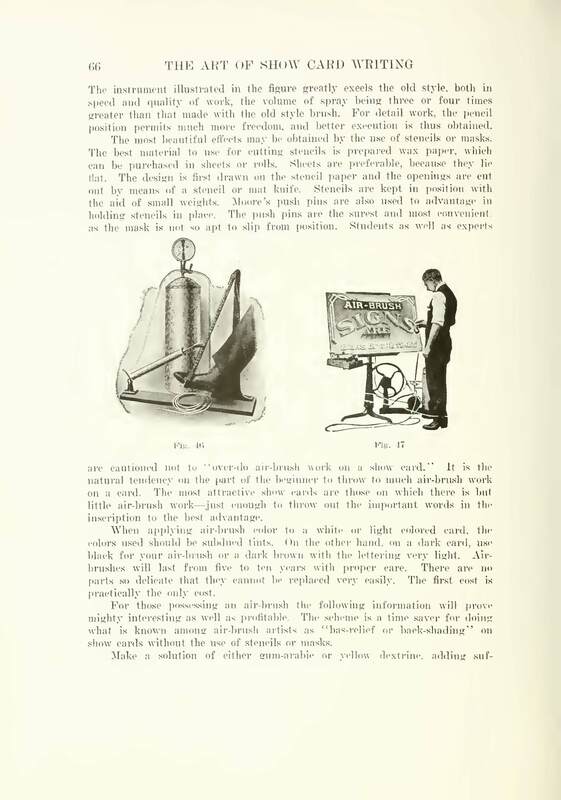 Contemporary illustrations of airbrushes depict compressors being operated by the artist using foot pedals as seen in the two images below, one from 1919 (but shown in a 1922 publication) and the other from 1890. 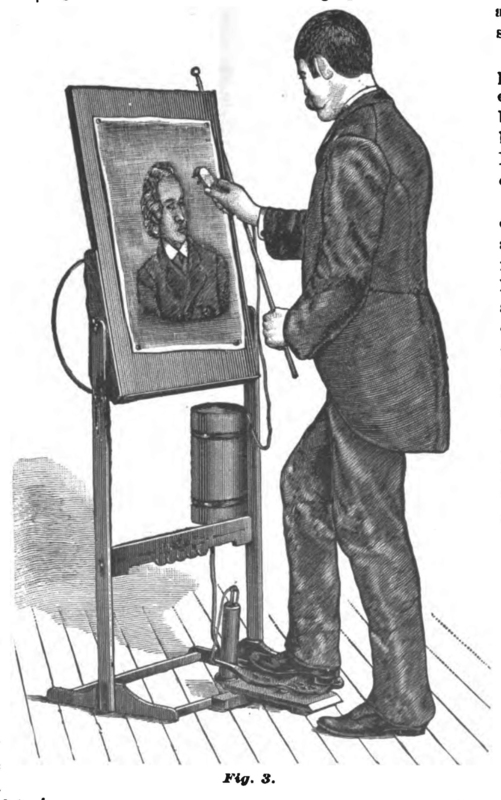 Note the change in attire from the well-dressed gentleman artist of 1890 to the commercial artist with rolled-up sleeves of 1919. Dwiggins’ artist belongs to the former category of artists reluctantly lowering themselves to take on commercial work. Illustration (p. 66) from The Art of Show Card Writing by Lawrence J. Strong and Charles J. Strong (Chicago: Frederick J. Drake & Company, 1922). Originally published by the Detroit School of Lettering in 1919. 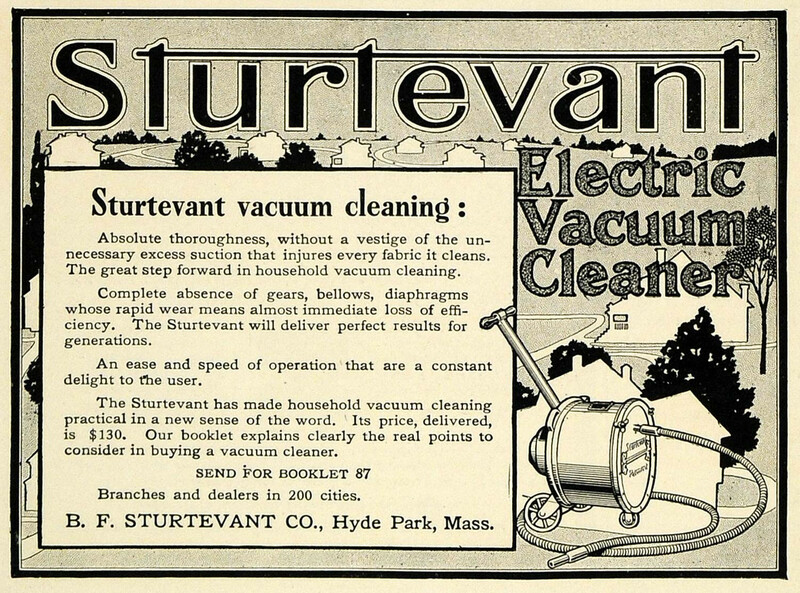 Advertisement (1911) for The Sturtevant Electric Vacuum Cleaner. Illustrator unknown. 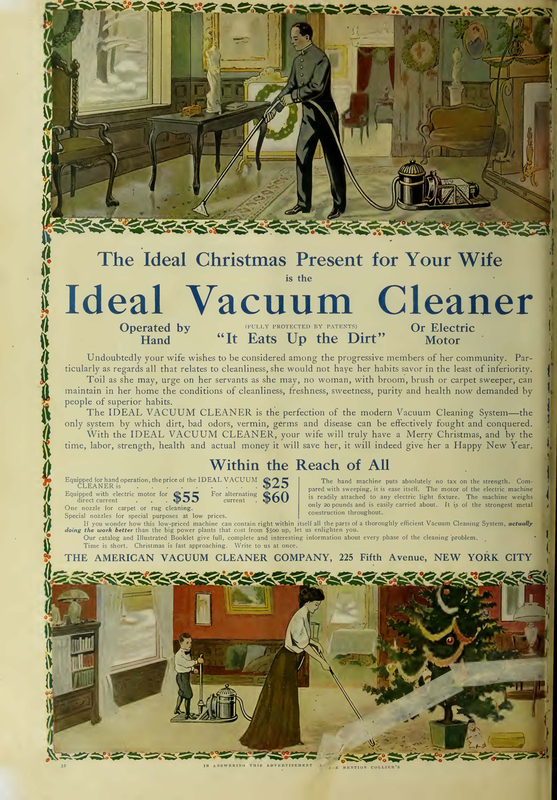 Advertisement for the Ideal Vacuum Cleaner made by The American Vacuum Company. From Collier’s magazine (December 1908). I suspect that Dwiggins not only found the illustration of the young boy operating the lever of the vacuum cleaner pump amusing, but that he also recognized its potential for transformation. In his hands the African servant replaces the young boy and in doing so immediately conjures up the many images of African and Asian servants serving their colonial or plantation masters: bringing them drinks, fanning them with gigantic palm leaves, being carried in a palanquin, and so on. Was Dwiggins aware of the racist undercurrent in his drawing? I doubt it. He had a lifelong love of the exotic and the African servant in “New Ideas in Illustration” would have been inspired by his childhood reading of books such as New Arabian Nights (1888) by Robert Louis Stevenson and King Solomon’s Mines (1886) by H. Rider Haggard. 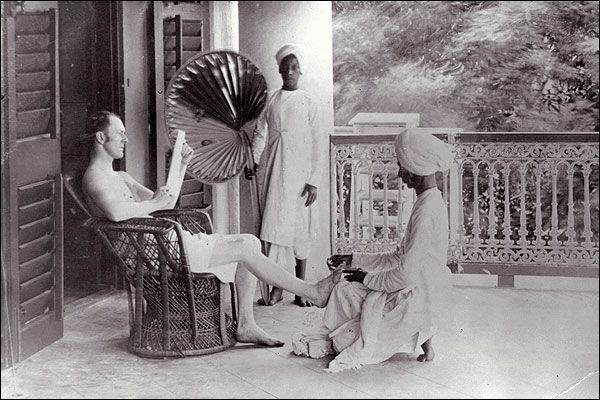 Life of a British Army officer during the early days of British rule in India. From Pinterest. Racism, colonialism, orientalism, etc. are not concepts that Dwiggins would have been thinking of when he made this advertisement. Instead, his emphasis was on the apathetic artist who was allowing a machine (operated by others) to do his work. The drawing is an Arts & Crafts-inspired attack on the machine in the realm of art. As far as I know, Dwiggins never used an airbrush in his life. Some of his work, such as the drawings he did for Tales by Edgar Allan Poe (Chicago: The Lakeside Press, 1930), have an airbrush appearance. But for them he used an old-fashioned spatter technique involving a worn-out toothbrush. Not only is the artist in the Warren advertisement using an airbrush, but he is also using template “no. 47” which consists of the platonic forms (circle, triangle and square) pre-Bauhaus, some unidentifiable image or text, and a grid of tiny holes that anticipates the “fly-specks” Dwiggins was drilling in acetate during a visit from Paul Hollister in the mid-1920s. These advertisements for S.D. Warren coincided with some of Dwiggins’ earliest stencil experiments, most notably the two illustrations he included in The Fabulist no. 2 (one of which is reproduced below). They were done entirely by hand, from conception to finish. There were no templates. Illustration of Chinese woman from The Fabulist no. 2 (April 1916). Hand stenciled (with 9 colors) by W.A. Dwiggins. There is an advertisement for the Sweeper-Vac from The Pneuvac Company of Boston, a “combination sweeper and vacuum using both the revolving ‘bissell type’ brush roll and pneumatic suction.” The illustration is most likely by Dwiggins who definitely did the lettering. 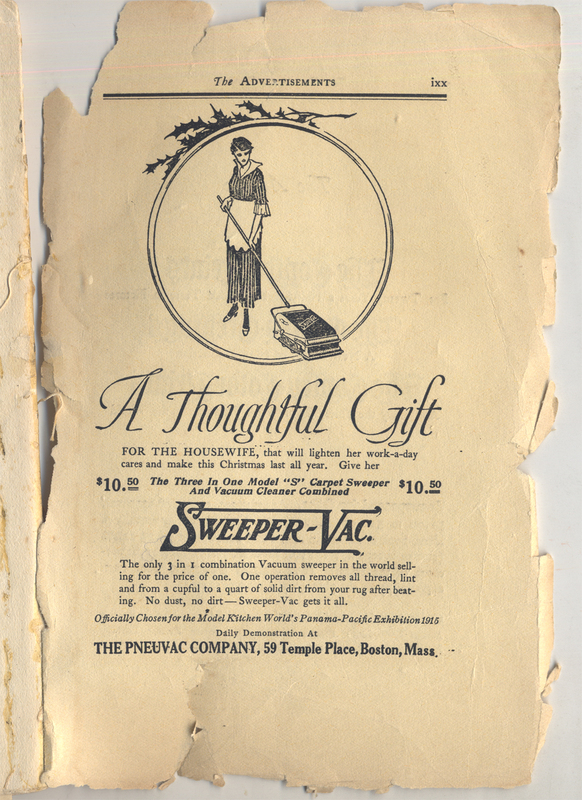 Advertisement for Sweeper-Vac. From The Cornhill Booklet (December 1914). Illustration and lettering by Dwiggins. 1. Stephens, Dwiggins and the Heintzemann Press had a complicated—but critical—relationship that will be the subject of a future post. Gordon, in his essay “Dwiggins Enters the Scene” in Postscripts on Dwiggins (New York: The Typophiles, 1960), vol. II, pp. 176–183, says he met Dwiggins in 1916 but he has the circumstances—the redesign of an insurance policy—wrong. The insurance policy redesign for Liberty Mutual occurred in 1918. Also, Gordon, despite early training as a printer, was not a partner in the Cambridge, Massachusetts printing firm of Gordon-Taylor as Bruce Kennett asserts in one of his @WAD tweets. The company’s partners were Eugene Gordon and G. Gehman Taylor. 3. Dwiggins’ account books list work on “New Ideas in Illustration” on both May 16 and 18, 1914 with a second entry for the latter referring to the job as “The New Ideas in Illustration.” Despite the change in wording this was the advertisement with a man framed by a triangle. 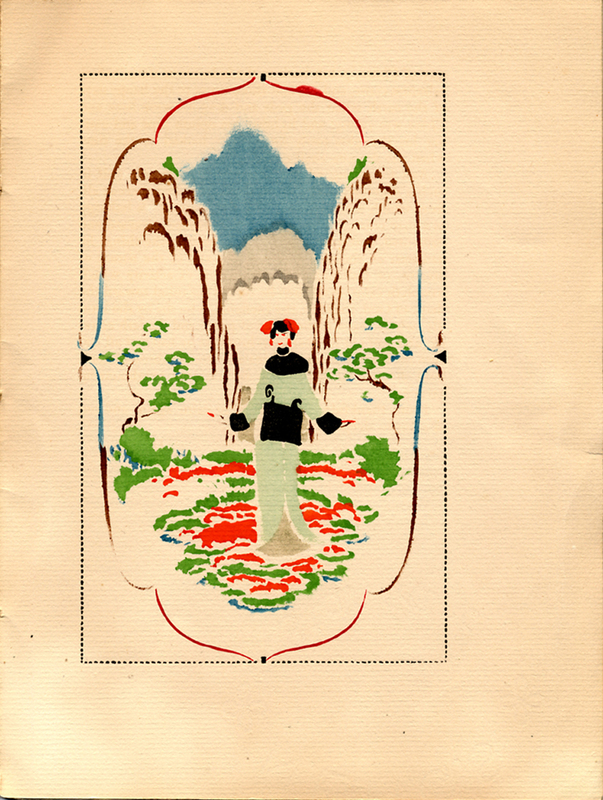 It first appeared in the September 1914 issue of The Printing Art Suggestion Book. The second advertisement was the one with the man lounging in the armchair. It appears in the account books as paid September 1, 1914 under the heading “Drawing for Warren insert”. Dwiggins worked on the third advertisement (described as “Salesman with drawing”) on December 18, 1914 and was paid January 1, 1915. His descriptions of each job varies slightly, with some mentioning both illustration and lettering and others replacing illustration with design. For each of them he was paid $25 regardless of the description of his contribution. An unusual aspect of the advertisements is that the first two are signed “William Addison Dwiggins” instead of the more customary WAD or the earlier D.
4. Dwiggins’ account books have entries for the vacuum cleaner drawing on November 25, 1910; January 24, 1911 and October 26, 1911. There is no surviving artwork in the Dwiggins Collections at the Boston Public Library and I have not located an example elsewhere. Dwiggins also made drawings of ventilating sets and propeller fans for Sturtevant. 5. There is also a variant advertisement for the Ideal Vacuum Cleaner on Pinterest that has a young girl operating the lever. 6. 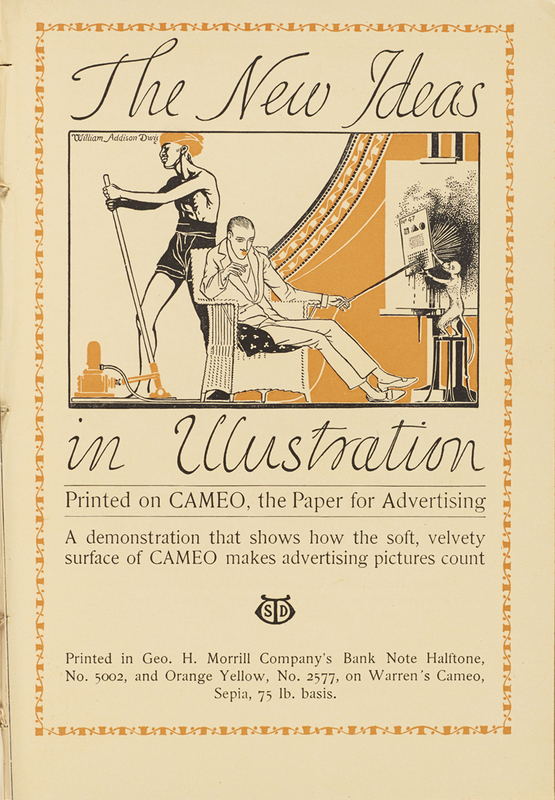 See “Typographic Fly-Specks: A Starting Point for Decorative Printing” by Paul M. Hollister in Direct Advertising, vol. XIV, no. 3 (1927), pp. 27–32. Could the border of black dots in the stencil illustration have been made using drilled ‘fly-specks’?